This article is the latest in a series which introduces Series Points, a new ranking method for Test players which directly compares all players together (i.e. batsmen and bowlers as well as fielding ability), whilst also awarding more points to players who performed well against stronger opposition (the original article has a more detailed description of series points for teams and individuals, suffice it to say here that we divide up the team series points [TSPs] into individual series points [ISPs] based on their performances with bat, ball and in the field). I also covered in the original article the Test Player of the Decade for the 1930s, following which we have looked at the 1920s, 1940s and the 19th century. So, going back to the beginning of the 20th century, I would like to present to you the Test Player of Crickets Golden Age. I decided to combine the points for all of the Tests played between 1900 and 1914 as the latter decade was much shortened in terms of Test cricket due to the First World War; plus, this period taken together is generally considered to be the Golden Age of cricket. We can see that the above list contains a mouthwatering list of great names which we would expect to be prominent for the time period, and four players (Trumble, Rhodes, Armstrong and Barnes) achieved two Player of the Series awards during this period. Series performances by two individuals during the period deserve special mention:- Aubrey Faulkner scored an enormous 178 ISPs, almost 28% of the South African total in 1909-10, thanks to 545 runs at 60.55, seven catches and 29 wickets; Sydney Barnes took 34 South African wickets in only three Tests during the triangular tournament (his 144 points extrapolates to 240 for five Tests), then went on to take an equally remarkable 49 wickets in only four Tests the next winter. Rhodes, Armstrong and Barnes multiple Player of the Series awards translated into top spots over the decade, although Rhodes is some way ahead. Barnes played in significantly fewer Tests than the two men ahead of him, however. 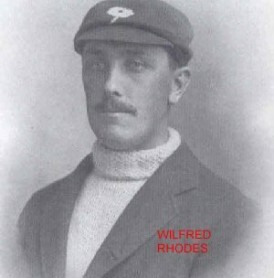 Rhodes was one of the greatest all-rounders of all time, and took more first-class wickets than any other player in history (4204). England played 59 Tests during this period, with Australia next on 49 and South Africa only 32. Taking into account this inequality of opportunity as regards number of Test matches played, lets look at each players points per five-Test series (PP5), i.e. the average number of points the player would have scored in a five-Test series, based on his average points per match multiplied by five (as we did in the previous articles). Hugh Trumble maintained his great form at the end of the 19th century with two consecutive Player of the Series awards, giving him four in a row, with scores of 110, 105, 139 and 135; at this point, only Monty Noble had even two consecutive performances over 100. Sydney Barnes was ridiculously under-used by the selectors, eventually going on to destroy minor league cricket teams with Staffordshire, and this chart shows just how valuable he was in Tests, maintaining a very high level of play over 26 Tests as compared to 13 played in by Trumble, who admittedly was coming to the end of his career. Australian Charles Kelleway, making his debut in 1910, also played well during the triangular tournament, with two hundreds and 10 wickets in the six Tests. Jack Hobbs scored well in the Golden Age also, even though his best was yet to come; he was astonishingly consistent during the decades of the 1920s and 1930s, totalling 382 and 385 points respectively. We touched on Aubrey Faulkners amazing performance against England in 1909-10, and although he also played well against Australia the following winter, he would not scale those heights again. Bill Whitty took the Player of the Series award in the 1910-11 series against South Africa with a 37-wicket haul. Frank Woolley was one of the greatest ever English all-rounders, and he scored well enough to finish highly despite not winning a Player of the Series award during this period, playing particularly well against Australia in 1911-12 and in the Triangular Tournament, where he was very close to Syd Barnes (175 to 179 by Barnes). Jack Saunders achieved some degree of notoriety for his performance during the 1902 Australian tour of England, however he scored more ISPs (87 to 70) in the 1907-08 Ashes series. Monty Noble came close to winning two Player of the Series awards, finishing second to Hugh Trumble in 1901-02 (139 to 129), then again to Warwick Armstrong in 1907-08 (116 to 104). Wilfred Rhodes totaled more ISPs than any other player in the Golden Era, with high-scoring performances in the 1902, 1903-04 and 1911-12 Ashes series as well as the triangular tournament. As mentioned at the close of the previous articles, it was necessary to have a qualifying number of games, however at least one of the non-qualifiers deserves a special mention. Frank Foster outplayed even the great Sydney Barnes during the 1911-12 Ashes series and went on to play very well during the triangular tournament, but his career sadly ended after a motor cycle accident during the war. Some of the better known players who did not make the top 20 lists here include:- FS Jackson (Eng), who scored well but appeared in only two series (24th place); Colin Blythe (Eng) 225 points in 19 Tests (25th); CB Fry (Eng) 196 points in 19 Tests (30th); Archie McLaren (Eng) 191 in 19 Tests (33rd); Reggie Schwarz (SA) 186 points in 20 Test (34th); Gilbert Jessop (Eng) 125 points in 17 Tests (47th) and KS Ranjitsinjhi (Eng) 4 points in 3 Tests (141st); the ranking for some players in this era suffer from their best period being split around the turn of the century. The next article will concentrate on the 1950s.